Significance : Jageshwar is believed to be one of the 12 Jyotirlingas. Jageshwar is a Hindu pilgrimage town in Almora district of Uttarakhand state. Nestled in Kumaun region, 36 km northeast of Almora, this temple town is believed to be the site of the first of the 12 Jyotirlingas. Situated at an elevation of 1,870 mts above sea level, it is an important tourist destination in Kumaun and thousands of people visit Jageshwar each year especially during Shivratri. Set against the backdrop of breathtaking deodar forest in the Jataganga river valley that starts from Artola village on Almora–Pithoragarh highway, where two streams Nandini and Surabhi flow down the hills in the narrow valley and meet near the temple compound. The confluence of the two streams is considered a sacred spot. The beauty of Jageshwar is graced by the beautiful 'deodar' tress and the sight of Jataganga flowing through the valley. The calm and tranquil atmosphere makes it an ideal for yoga and meditation. The temple city was once the center of Lakulish Shaivism (worship of Lord Shiva with the mace). According to folklore, there were close to 400 temples inside the complex but only less than a half survive now. Largely devoted to Lord Shiva, most of them are tiny. These temples and sites are maintained by Archaeological Survey of India (ASI). 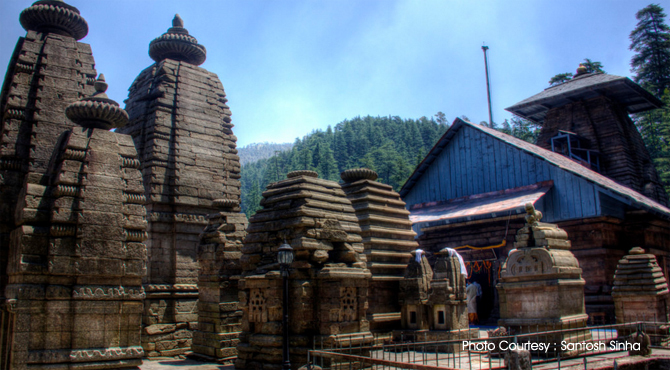 The temples of Jageshwar is an excellent example of the Nagara style (north Indian temple architecture) of architecture. The stone icons are various and impressive. There are temples dedicated to Child Shiva (Baal Jageshwa) and Old Shiva (Vridh Jageshwa). The main temple in the temple complex is dedicated to ‘Baal Jageshwar’ and the other temple dedicated to ‘Vridh Jageshwar’ which is situated on the higher slopes. The temple city comprises a cluster of almost 200 temples large and small stone temples, dating 9th to 13th century AD. Of the numerous temples, the major one is the Maha Mrityunjaya Temple. Other temples, dedicated to Surya, Navagraha and Neelkantheshwara belong to a later age when the Katyuri kings added to the existing structure some 800 years later. The other main temples of Jageshwar include Dandeshwar Temple, Chandi ka Temple, Jageshwar Temple, Kuber Temple, Nau Durga, Nava-grah Temple, a Pyramidal shrine and Surya Temple. The Maha Mrityunjaya Temple is the oldest temple . Built in the 8th century during the Gupta period, it is situated in a valley and surrounded by green alpine trees. The temple has an eye-shaped opening. Dandeshwar Temple is the largest shrine of Jageshwar. Situated a short drive up the valley, it is dedicated to Lord Shiva and was built by the Katyuri kings in between the 9th and 10th centuries. The temple houses an 18th-century icon of the dancing Shiva. There is a huge iron bell at the gateway of the temple which forms an important link between the local deity known as Gollu Devta and Lord Shiva. Its sanctum has a square shape and the Shikhara (Spire) is different from other temples in the region. It is a must visit place in Jageshwar because it is less crowded and the nearby stream and deodar forest is a nice place to explore. A number of festivals are held here; the main festivals of the town include the Shivratri mela usually held in the month of March and the month-long Jageshwar Monsoon Festival which starts on August. The Mirtola Ashram is a place of spiritual and natural beauty and has been built around a Shiva Temple with the name of Uttar Vrindavan. The Archaeological Museum is another popular must see place in Jageshwar. The museum contains 174 sculptures which found in the region from the temples of the Jageshwar dates from 9th to 13th century AD. The museum has two galleries and some of the prominent sculptures are Uma-Maheshwar, Surya and Navagraha. Opening Hours : 10.00 am to 5.00 pm; Closed on Fridays; Admission is free.